I love meatloaf and I love love love stuffed peppers so I finally decided to do what I’ve been thinking about for a long long time, Meatloaf Stuffed Peppers. Glad I finally did too, they were a filling and delicious paleo meal for me and my husband. In fact, so filling we each had half a pepper for dinner and the other half for lunch the next day. I kind of like having a premade lunch waiting for me it the fridge. Except I wanted to eat it for breakfast, that part was kind of lame but the no-cook lunch part was good. 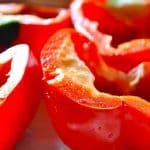 Looking for a good low carb/paleo stuffed pepper this is the perfect recipe. And yes they are paleo, no breadcrumbs just egg holding it all together in there. If you’re NOT paleo, by all means, add bread crumbs or oatmeal or whatever you use. I like to add a 1/2 cup of almond meal to my meatloaf recipes to help bind them and keep them low carb. But because these are in peppers you don’t need to do that. You can of course but there is no need to add a binder. 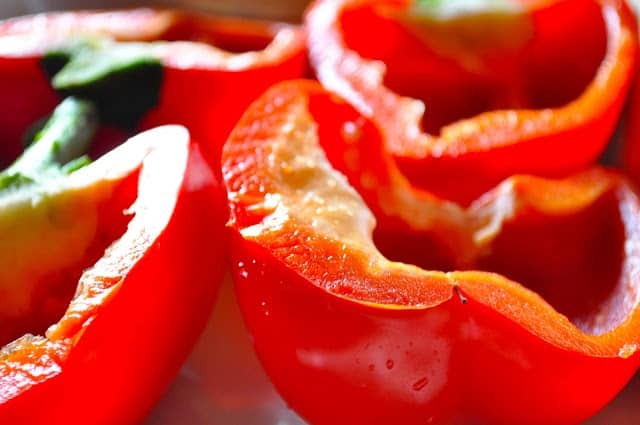 If you’re looking for a different low carb stuffed pepper recipe try my Taco Stuffed Peppers. Perfect for Taco Tuesday! Maybe you’re tired of carb-filled tortillas or maybe you’re out of tortillas, my Taco Stuffed Peppers will save the day! 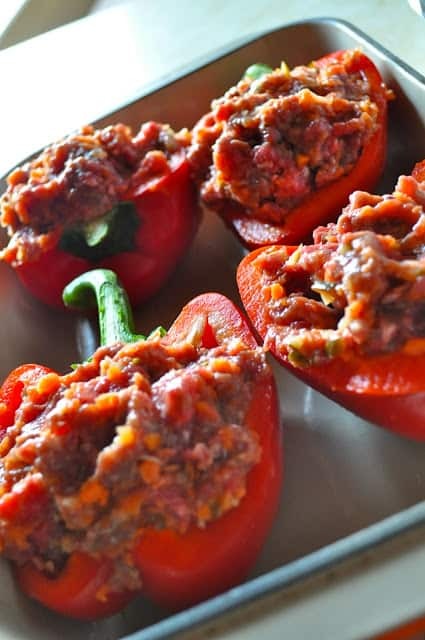 This Meatloaf Stuffed Peppers recipe is a tasty way to make meatloaf. It's Low carb and Paleo but tastes so good anyone will enjoy it. Not Low Carb or Paleo?? If you are not paleo or low carb feel free to add a swipe of ketchup on the top or barbecue sauce or whatever you happen to like. Myself I like a little tomato sauce mixed up with smoke flavor and a bit of maple syrup but I figure everyone has THEIR favorite way. I see 3 pickles in the ingredient list – but no mention in the recipe of how they are used. Can you clarify what I am to do with the pickles? AHA! I need an editor whoops! You chop them with the carrot and onion–thanks for catching that. Do you precook the hamburger or let it cook in the oven? It will cook in the oven!